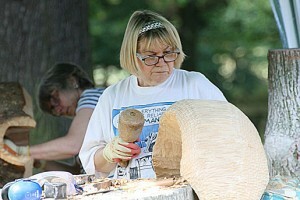 August saw me attending a 5 day wood carving course at Yorkshire Sculpture Park with tutor Arthur De Mowbray. I learnt much more about choosing, handling and ‘reading’ wood, added to my carving skills and enjoyed some rare sunshine. I returned with a partly carved piece of beautiful Cedar of Lebanon, windblown timber from the Yorkshire Sculpture Park grounds, and aim to complete the sculpture this winter in order to show it at my Plockton exhibition in mid May next year.